We’ve started to develop our best-seller TrashMe in 2010. Since then, we’ve drastically improved the algorithm to be as accurate as possible when searching for related files to delete. Because our customers don’t want to remove critical files from their system. Because our customers want to rely on an accurate search engine. Some uninstallers are not so accurate. 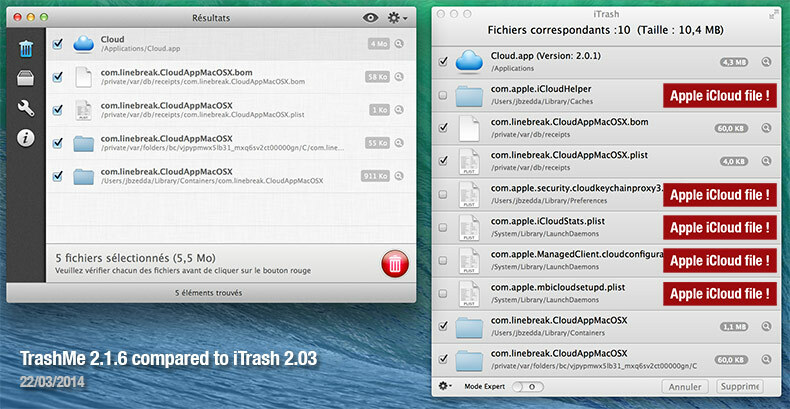 For example, we compared TrashMe to iTrash when uninstalling CloudApp application (see picture below). At first glance, iTrash gives us more results: 10 files instead of 5 files for TrashMe. But look at the results: even with the “Expert mode” disabled, iTrash is inaccurate, listing some critical files used for Apple iCloud settings. 5 files among the 10 files founds are completely wrong. We’ve tried uninstalling other applications and found similar issue: when uninstalling Adobe Illustrator, TrashMe is finding 5 related files where iTrash is finding 34 files offering us to remove all Adobe settings (Photoshop, Acrobat…) ! So, be careful, always choose an uninstaller with high accuracy. TrahsMe is only 7.99 US$, available on the Mac App Store.